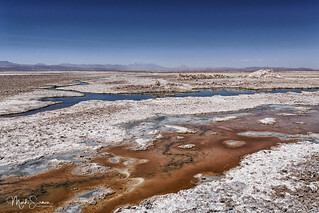 Located in the Salar de Atacama, the Chaxa lagoon is a natural salt pan, i.e. a flat expanse of ground covered with salt and other minerals that can be found in deserts. Despite the extreme conditions, the Salar de Atacama sustains a wide variety of species including Chilean and Andean flamingos (the latter using it as an important nesting site). The reserve has a desert climate with the temperature varying dramatically between day and night. With an average high of 3 millimetres, rain gives only a modest quantity of water. But together with the water coming from the snow-capped volcanoes, there is enough water to form a lagoon even in this extremely dry environment.